American Heart Association Healthcare Provider Basic Life Support (BLS). 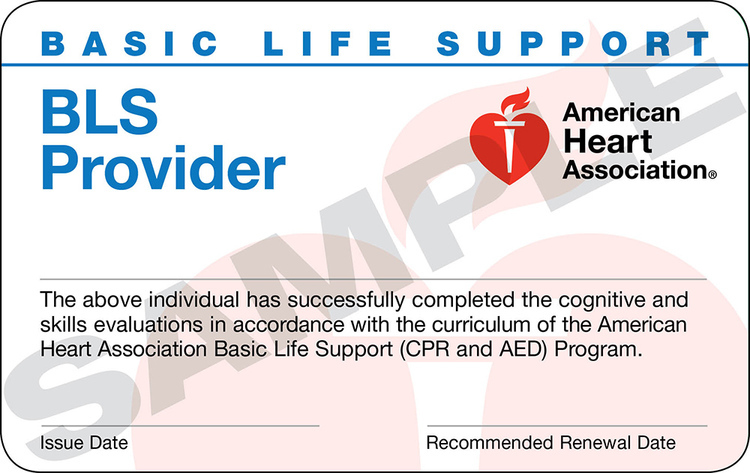 Certificate: 2 year American Heart Association (AHA) Healthcare Provider BLS certification ecard given the very same day. The card now says "BLS" at the top and this was changed by the AHA in June of 2016. What is the card and certification for? This is a cpr and aed class for healthcare professionals. This cpr and aed (BLS) class for healthcare professionals includes a 25 question written quiz at the end of class. Who is this class for? : Nurses, law enforcement and EMS personnel, EMT, fire fighters, doctors, PA's, athletic trainers, dentists, CNA, business and industry response teams, lifeguards, flight attendants and anyone with patients. Class length: Approx 3 hours to 3 hours 15 min. You will love that we provide all participants with an upbeat and hands-on educational class, plenty of first aid supplies, aed trainers, your own cpr manikin and even free pens, face shields and cpr keychains for each student! Come to our sites for classes in West Palm Beach, Coral Springs, Pompano Beach, Tallahassee, Miami or Fort Lauderdale, or we can travel to your school, office, business, clinic or home anywhere in FL for private, small or large group trainings that has been ranked number one from 2006 to 2019.